A very special year lies ahead for the International Rose of Tralee Festival. 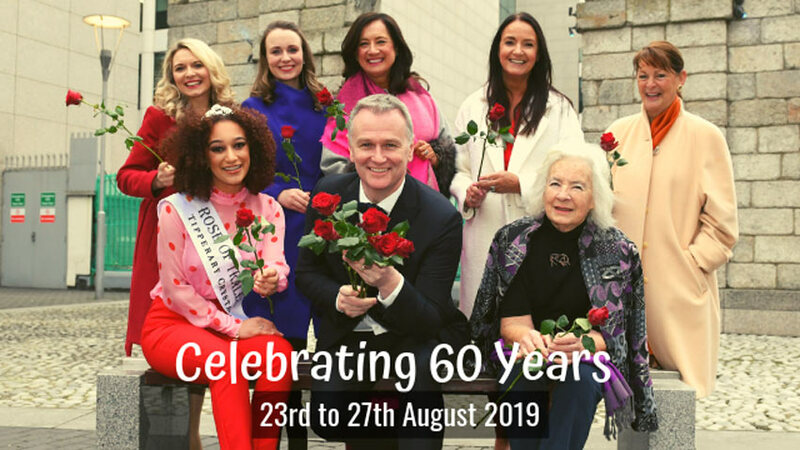 It’s hard to believe it but the festival is celebrating a staggering sixty years in existence and like all the many Rose centres around the world, the Dublin Rose Centre will be pulling out all the stops to mark this very special milestone. THERE’S never been a better time to apply to be the Rose of Tralee because, this year, Ireland’s most famous family festival will celebrate 60 years from Friday 23rd to Tuesday 27th August 2019. Rose of Tralee regional selections will be staged in towns and cities all over the world from February to June and anyone interested in entering their local Rose of Tralee event can do so online at www.roseoftralee.ie/apply. The Rose of Tralee, Kirsten Mate Maher, RTÉ Presenter, Dáithí Ó Sé and the first Rose of Tralee, Alice O’Sullivan, officially launched the search for the young woman who will win the title in the Diamond Jubilee Year. They were joined in Dublin City Centre by Roses of Tralee from every decade of the Festival’s 60-year history: Cathy Murphy (1969, Dublin Rose), Marita Marron (1979, Belfast Rose), Sinéad Boyle (1989, Dublin Rose), Geraldine O’Grady (1999, Cork Rose) and Charmaine Kenny (2009, London Rose).